Often daunting, always exciting, summer intensives are of the utmost importance for the training of a pre-professional dancer. Most are between three and five weeks, jam-packed with learning, dancing, and making new memories. All professional dancers started as students much like you, attending summer intensives and feeling excited and nervous. 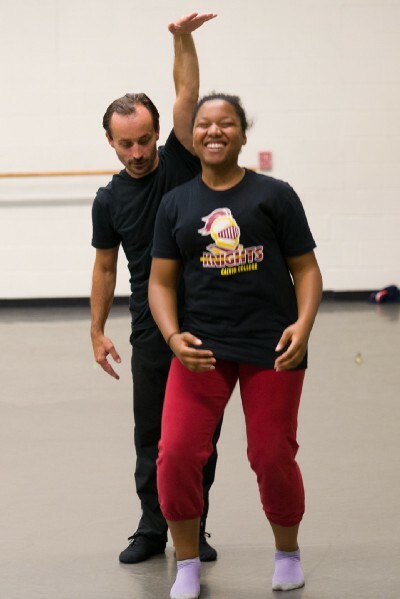 As a student, I found that the summer intensives I attended ended up being some of the most transformative years of my training toward become a professional dancer. Whether it be the stellar training, diverse repertoire, adventurous weekend activities, or friendships I made, I never regretted attending a single one of them. Regardless if you’re attending a shorter three-week program or even a longer seven-week program, here are some tips to help you survive and thrive during your summer intensive. • As in life, this applies to everyone at your intensive. These are your peers, contemporaries, and teachers. You will run into them again, so always have a smile and a kind word. • Make sure you’re in shape before you arrive; do not take time off leading up to an intensive. Up to two weeks before you arrive, you should be taking class every day to ensure your body is in good condition. • Pack the right things in your suitcase. Of course, start with ballet clothes that follow your school’s dress code, but be prepared to spend time outside the studio exploring your host city. For example, Grand Rapids gets quite warm in the summer but it occasionally has a cooler rainy day (this is Michigan, after all—if you don’t like the weather, just wait an hour). So, you should pack summer clothes and a rain jacket. And don’t forget things like a sewing kit. • Stay positive. Remember teachers only give corrections because they are trying to help you, so don’t allow yourself to get into the mindset one teacher doesn’t like you. And please don’t fret about your level placement; you are placed in the level in which the school faculty knows you will succeed. • Work hard and your effort to improve will be noticed. Give everything your best effort; there’s no time like the present to work hard. • The need for a dancer who is able to do both classical ballet and contemporary dance is growing. so it’s important to start as a student—be open to trying new styles. • You may be scheduled to take classes you don’t normally take at your home studio like character, hip-hop, or Pilates. These classes are all great ways to grow and learn as a dancer and they were included in the curriculum to help you. And you might just end up loving it. • Remember, your teachers might teach a step slightly differently than they do at your home studio. That’s OK. Different styles of ballet steps (Vaganova, Cecchetti, Balanchine) have differences and it does not mean they are teaching the step incorrectly. As a professional dancer, the choreographer wants you to do their step their way—not your way, mom’s way, or your home studio’s way. Again, you will learn something new, which is always a good thing. Trust them. • I think you know what I am going to say here: Follow the dress code that is a given to you to the letter. Remember, you’re asked to wear a black leotard or pink tights so your teacher can see your lines well. You’re only at this school for a short number of weeks, so you want to put your best foot forward figuratively and literally. • Dancing 4-6 hours a day means a lot of sweat, so wear deodorant and shower regularly. This is common sense. • Make sure you’re eating enough to sustain how much dancing you’re doing every day. When you’re craving a snack, have one, but make sure it’s nutritious, sustainable, and minimally processed. And it goes without saying: water, water, and more water. • Sleep six to eight hours per night (maybe even more, if possible). There’s nothing like a full night’s sleep to prepare you for a full day of dancing and working hard. • Enjoy yourself! Go on those weekend activities; I promise you will make memories that will last a lifetime. • Connect with your new friends…Instagram, email, Facebook, phone numbers, Snapchat. Keep in contact and continue to grow your dance network. You may find yourself next to many of them at the barre in the future and a friendly face is always a nice thing to see. Do you or someone you love have Parkinsons? Are you a doctor, nurse, or other caretaker of a Parkinson’s patient? 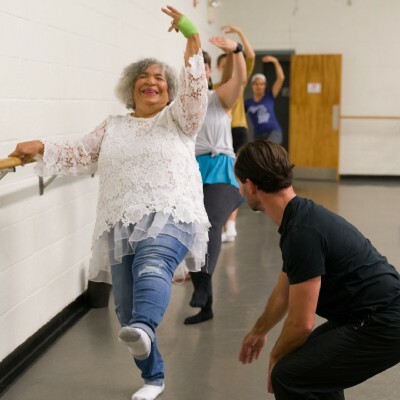 In support of National Parkinson’s Awareness Month in April, we’re opening our doors in partnership with Parkinson’s Association of West Michigan for all of you to experience our “Dancing with Parkinson’s” class. 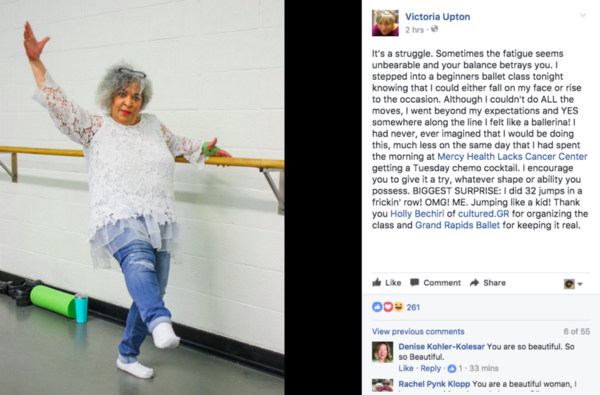 Dance is an effective therapeutic tool to help those with Parkinson’s stay fit both mentally and physically. It also increases confidence and provides an excellent form of social interaction. The free open house will provide an excellent opportunity to network with professionals in the industry as well as other patients and community supporters. 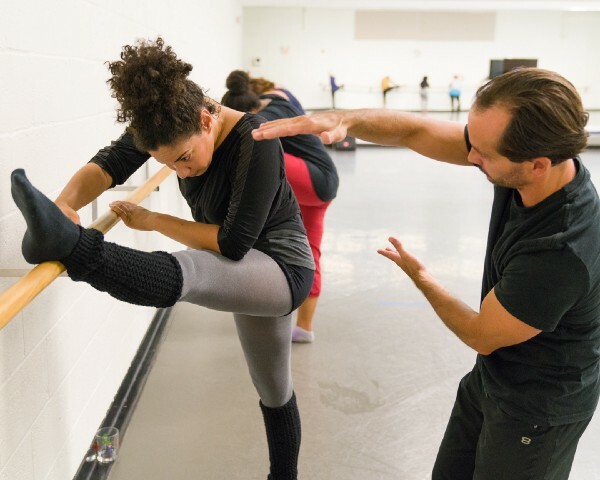 You’ll take our 45-minute “Dancing with Parkinson’s” class taught by Grand Rapids Ballet School principal, Attila Mosolygo, accompanied by live piano music. There will also be complimentary refreshments. For more information, call 616.454.4771 or email Atilla today. To learn more about Parkinson’s, click here. Thank you to our partners at Spectrum Health and Grand Valley State University for helping us out, too. We also thank our friends at WZZM for doing a feature on us. Check it out here. Let’s keep the conversation going and let’s #EndParkinsons! When the average student thinks of summer vacation, words like “beach” (as in lazy days on), “sleeping” (as in late), and “binging” (as in Game of Thrones) are probably some of the first to come to mind. But for others, the words might be “sweat” (as in breaking a), “work” (as in hard), and “intensive” (as in summer). 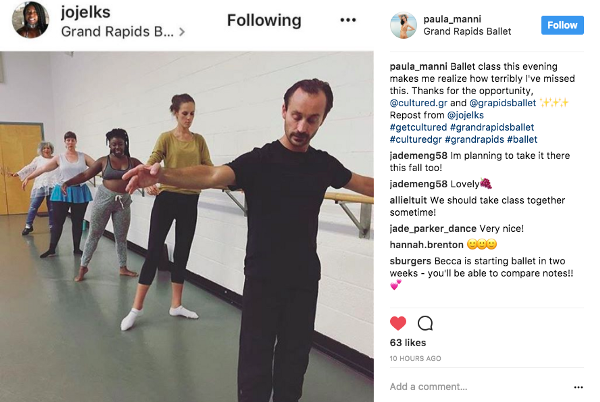 Grand Rapids Ballet’s annual Summer Intensive, scheduled for June 26-July 28 at the Meijer-Royce Center for Dance, gives you the rare opportunity to refine your ballet skills in technique and artistry. You’ll get face-to-face, hands-on training with some of the best stars and renowned master teachers from today’s ballet world including Patricia Barker (current Grand Rapids Ballet artistic director and former principal dancer with Pacific Northwest Ballet), Nicole Ciapponi (Joffrey Ballet), Elizabeth Murphy (Pacific Northwest Ballet), and Aaron Renteria (Joffrey Ballet). You’ll also gain valuable insights through seminars and specialized classes in nutrition, injury prevention, cardio training, and more. To be considered for our Summer Intensive, interested students must first audition in person (schedule below). Dancers attending these open auditions are asked to arrive at least 15 minutes early in order to complete their registration on-site. Bring a head shot and a photo in arabesque; ladies, be prepared to audition en pointe, as well. The audition fee is $20. Call 616.454.4771 or email for more information on how to attend. Once you’ve auditioned, you may receive an invitation to attend our Summer Intensive at Grand Rapids Ballet. Senior students (age 12-19) will attend class Monday-Friday from 10am-5pm and junior students (age 9-15) will attend class Monday-Friday from 10am-2pm; it’s called an “intensive” for a reason. Tuition for senior students is $450 per week or $1,875 for the entire five-week course (save $375) and $250 per week or $975 for entire five-week course (save $275) for junior students. A limited number of scholarships are available and are awarded based on need and talent. So, while it’s no day at the beach, your hard work will produce amazing results and give you tools you’ll use throughout your dance career. That’s way better than tan. For more information on auditions, tuition, housing, faculty, and more, call 616.454.4771 or email us today. Also, be on the lookout for more information coming soon about our Summer 2017 Contemporary Intensive! Want to stay fit as a fiddle? 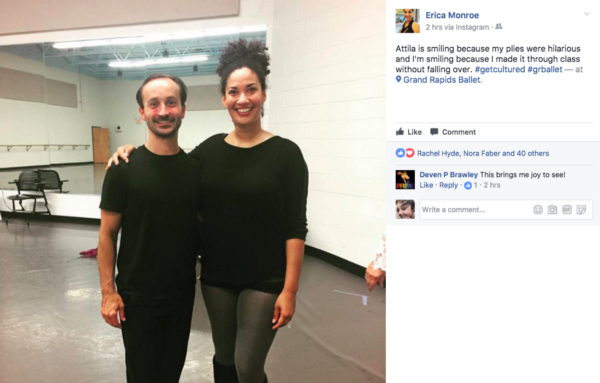 Attila Mosolygo is already a pro in the ballet world, as well as the assistant artistic director and principal of Grand Rapids Ballet School. But did you know he’s also got some mad skills in the gym? Dancing already burns tons of calories and the sporadic movements call upon many muscles. Many people envy the physique but don’t actually realize they can get a similar shape. Check out how he trains for performances and implement some of his moves into your regimen. Keep you back flat, legs straight, and hands placed outside of your shoulders. Push up with the hands placed directly under shoulders, upper arms remain next to the body in the down position. On a flat back with legs at 90 degrees and toes pointing up, keep your arms vertical with your fingers above your shoulders. This is a basic crunch with fingers extending up to the same level as the toes. And don’t forget we also offer adult ballet classes that will help you stay fit, increase flexibility, and raise your spirits. Find out more here.